Les Granges Bas in Lorraine is open all year in superb surroundings, in Gérardmer, the Pearl of the Vosges! 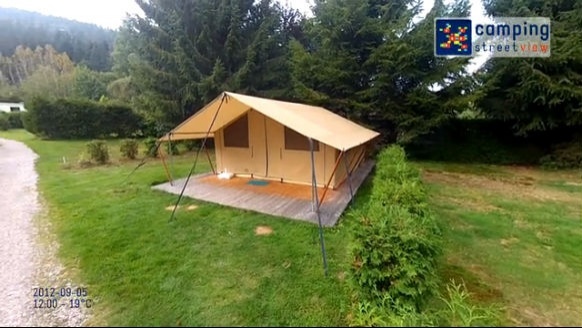 Located only 2 kms from the famous lake and 6 kms from the ski slopes, this campsite holds “Camping Qualité Lorraine” accreditation and, in summer and winter alike, it provides holidays in the fresh air in a unique natural setting on the edge of the forest that brings Lorraine its wealth. A true Lorraine welcome and family atmosphere make it a great place to stay. The 65 pitches, with or without electricity, are spacious (80 to 100 sq. metres). They are grassy, more or less shaded, and reserved for tents, caravans and camper vans. The 22 rentals (mobile homes and gîtes) can sleep from 2 to 6 people. On site, you’ll find a laundry, bread, WiFi access, mountain bike hire (July / August), a tennis court, table tennis, children’s playground, lounge and barbecue area. In Gérardmer, “water babies” can take advantage of the lake and its many water sports – canoeing, pedalos, sailing, swimming pool etc. In winter, the campsite attracts skiers, snowboarders and snowshoe fans. Only 6 kms from the campsite is the Gérardmer resort with 40 kms of downhill ski runs (some of them floodlit), cross-country skiing, playgrounds and even a toboggan run. This means that Les Granges Bas is also an ideal campsite for family skiing holidays in the Vosges! Mobile home Year 2000 (or <2000). 1 bedroom with 1 double bed 140x190 cm. 1 bedroom with 2 single beds 70/80x190 cm. Electricity Extra : 0.20 € / KWh (3 kWh per day included in summer ; 10 KWh per day included in winter). 1 Dog allowed. Cats not allowed. Mobile home Year 2009. 1 bedroom with 1 double bed 140x190 cm ; 1 bedroom with 2 single beds 80x190 cm ; 1 bedroom with 2 single beds 70x190 cm. Electricity Extra : 0.20 € / KWh (3 kWh per day included in summer ; 10 KWh per day included in winter). Animals not allowed. 1 bedroom with 1 double bed 140x190 cm. Electricity Extra : 0.20 € / KWh (3 kWh per day included in summer ; 10 KWh per day included in winter). 1 dog allowed. Cats not allowed. Mobile home Year 2010. 1 bedroom with 1 double bed 140x190 cm. 1 bedroom with 2 single beds 80x190 cm. Electricity Extra : 0.20 € / KWh (3 kWh per day included in summer ; 10 KWh per day included in winter). Animals not allowed. Electricity Extra : 0.20 € / KWh (3 kWh per day included in summer ; 10 KWh per day included in winter). 1 Dog allowed. Cats not allowed. Mobilhome Year 2010 & 2015. 1 bedroom with 1 double bed 140x190 cm. 1 bedroom with 2 single beds 80x190 cm. Electricity Extra : 0.20 € / KWh (3 kWh per day included in summer ; 10 KWh per day included in winter). Animals not allowed. Mobile home Year 2011. 1 bedroom with 1 double bed 140x190 cm. 1 bedroom with 2 single beds 80x190 cm. Electricity Extra : 0.20 € / KWh (3 kWh per day included in summer ; 10 KWh per day included in winter). Animals not allowed. Mobile home Year 2013. 1 bedroom with 1 double bed 140x190 cm. Electricity Extra : 0.20 € / KWh (3 kWh per day included in summer ; 10 KWh per day included in winter). Animals not allowed. Nouveau type d'hébergement entre la tente et le mobilhome. Sans sanitaire. Loué de mai à octobre. 1 Chambre avec 1 lit de 140x190 cm. Animaux non autorisés. Heure d'arrivée : entre 15h00 et 19h00. Jour d'arrivée libre. Heure de départ : entre 08h30 et 10h00. Mobile home Year 2018. 1 bedroom with 1 double bed 140x190 cm. 1 bedroom with 1 single bed 90x190 cm and 1 upper single bed 70x190 cm. Electricity Extra : 0.20 € / KWh (3 kWh per day included in summer ; 10 KWh per day included in winter). Animals not allowed. Das Bett war etwas zu kurz für mich. Ein 2 Meter langes Bett wäre für mich lang genug. Accueil sympathique de la responsable. Nous n'avons pas pu mettre la parabole à cause des arbres. Camping calme, emplacement parfait sans vis-à-vis, propreté des sanitaires, service pain très apprécié. L'espace de jeux pour enfants est un peut "vieillot" et minimaliste et il manque des robinets d'eau froide en dehors des sanitaires. Camping calme et à l'écart avec barrière à code, on peut laissé les enfants jouer en toute sécurité. Les sanitaires sont propres et pratiques. 6 ampères peuvent être un peut juste selon l'équipement de la caravane.